Is your Teen interested in learning piano, or are you interested in keeping him or her interested in piano? A low-pressure system of learning keeps teens interested, not stressed. Piano is a great outlet for teens to express themselves. If your teen has taken lessons before, or is brand-new to the piano, he or she will be playing piano with passion and enjoyment. Extra Weekly Lesson (via FaceTime or Skype): Teen students get an additional, weekly, private Video Call Lesson with the instructor to check-in. This is a perfect opportunity for students to ask any questions about their material. We will go through the student's pieces and the student will receive instruction and help right there and then! These mini-lessons get students to look forward to coming to their lessons, and they feel great about the quick progress they are making! Music Lab: For elementary through high school students, an additional half-hour may bescheduled for Music Lab (included with tuition, at no additional charge), and takes place either before or after the student's weekly, in-studio lesson. Students work on composing their own music, recording their music in GarageBand, study materials and watch videos to engage in our Composer of the Month program, learn about music history, engage in guided listening assignments, and utilize the many music theory programs on the computers and iPads that reinforce concepts taught in the lesson. Snack & Warm-Up: Students arrive 15 minutes prior to the start of the lesson time for "warm up." During this time students and their families may relax in the waiting room, enjoy the provided, delicious, organic snack (usually featuring a fresh, homebaked good, fresh fruit, and a refreshing drink), and the student has time to warm-up on the keyboard, allowing us to dig right in when the lesson begins! Performance Opportunities: There are many performance opportunities including studio recitals, care-home recitals, a summer pops and coffee shop concerts. 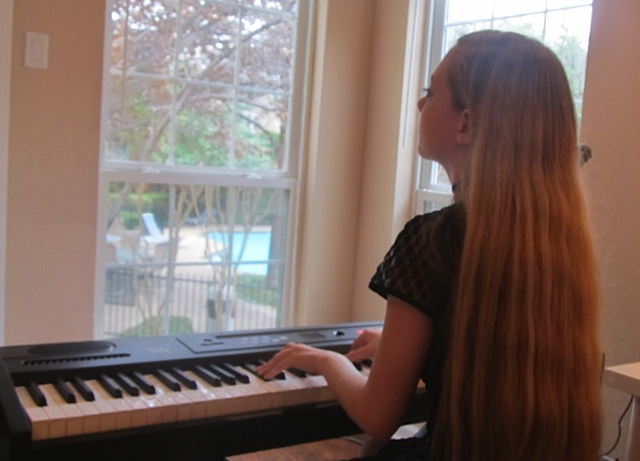 Practice Incentive Programs can really ignite our teen pianists, and the amount of practicing is amazing! Students can earn weekly prizes, and can earn iTunes gift cards. It's always nice to get recognized for efforts made, yes? Interested in learning more or want to schedule a lesson?